This entry was posted in Cate, divorce, Friends & Family, Lucy and tagged Catie, divorce, family, Lucy, pneumonia, separation, sick by Cindy. Bookmark the permalink. It’s a great feeling when it hits you that yeah, it’s yours alone. And yay for grandparent daycare!! So glad for your new normal!! Can’t wait to disrupt it for a few days when I visit!! Yay for 3 days! Make Lucy stop growing, she’s doing it too fast!! you are starting your new year off right…well except the sick cate part! this is your life…you are in charge…and it will be good…how can it not be with a studious little girl (that picture of catie doing “homework” slays me) and a baby with a smile that lights up all of north carolina! she is one happy kiddo you have there! and it is nice that your parents are close! that is good for you…but more importantly for the girls and the grandparents…that is a special bond that no grandparent should miss out on! P.S. I love that picture of Catie. She looks so in to her “homework”! 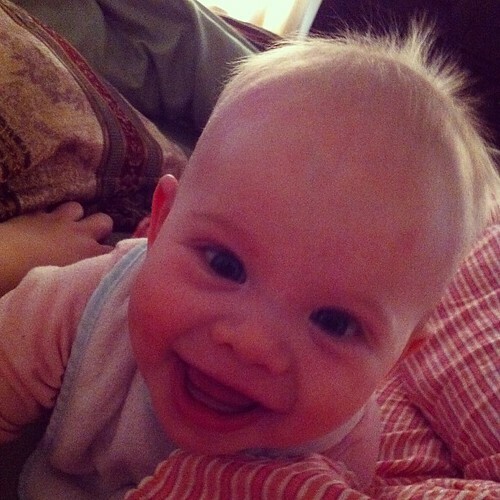 OMG, I love babies with their sticky-uppy hair and gummy smiles! LOVE!!!! This was a great update. 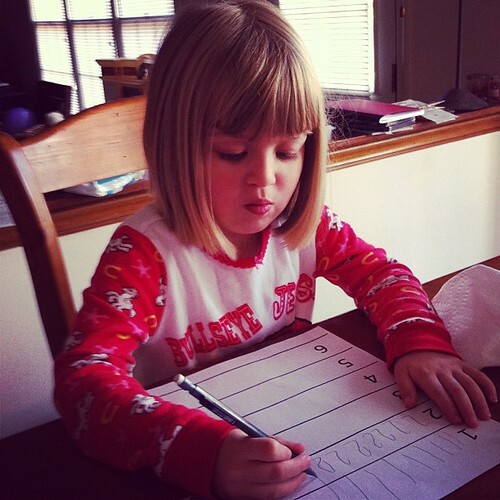 Your Catie sounds like a really smart little girl; it’s wonderful that she loves schooly stuff. Oh a new normal is good. I’m sure it was weird though. It’s so great that she was able to be there as long as you needed and even better that she’s still only a few miles away instead of states away.